These shirts have been produced by us for an upcoming Raging Grannies convention to be held in South Florida over MLK weekend. The silkscreen Raging Granny image is on a 100% cotton Raspberry colored American Apparel sweatshop free shirt made in the USA. 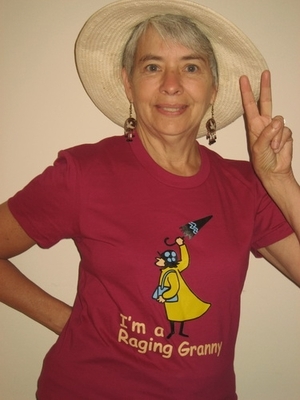 Raging Grannies will receive a $5 donation for every shirt sold on our site. For more information on The Raging Grannies conference please call 585-314-1413. Raging Grannies: Promoting peace, justice, and social and economic equality through song and humor. The first group to call themselves "Raging Grannies" sprouted on February 14, 1987 in Victoria, British Columbia. Several peace activists who had been doing street theater there began dressing up in outrageous hats and singing satirical songs to protest nuclear submarines, uranium mining, nuclear power, militarism, racism, clear-cut logging, and corporate greed. Raging Grannies groups quickly sprang up clear across Canada, all the way to Charlottetown, PEI, and down the Pacific Coast into the USA by way of Seattle. 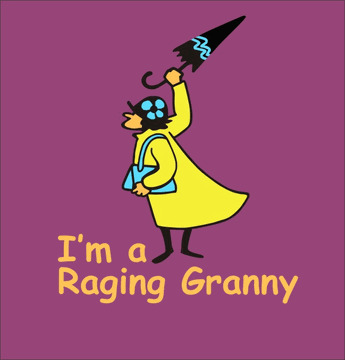 There are now more than 90 gaggles of Raging Grannies throughout the world.